We’d love your help. 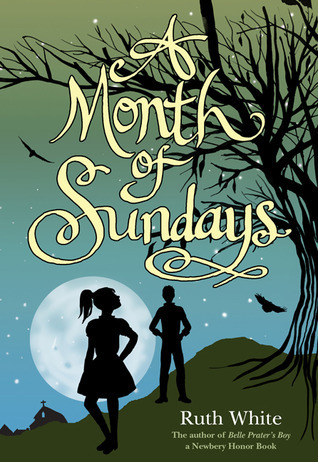 Let us know what’s wrong with this preview of A Month of Sundays by Ruth White. To ask other readers questions about A Month of Sundays, please sign up. I'm not sure if the dramatic ending was necessarily needed. There was already a lot of heart and content without "that." I won't spoil the ending for anyone. April Garnet Rose is a 14 year old girl who is sent to live with her Aunt June, Uncle Otis and cousins Avery and Emory, in Virginia (set in the 1950's) while her mother looks for a job in Florida. They are actually relatives of her father's, who left her mother while she was still pregnant with Garnet. Never having met them before and feeling abandoned, Garnet is very upset at the situation. Eventually, however, Garnet learns about the value of family while living with them. She also makes frien April Garnet Rose is a 14 year old girl who is sent to live with her Aunt June, Uncle Otis and cousins Avery and Emory, in Virginia (set in the 1950's) while her mother looks for a job in Florida. They are actually relatives of her father's, who left her mother while she was still pregnant with Garnet. Never having met them before and feeling abandoned, Garnet is very upset at the situation. Eventually, however, Garnet learns about the value of family while living with them. She also makes friends and even meets a boy named Silver. The best way to sum up this book would be with: "I don't think we get any easy answers in this life. All we get is questions" (pg.167). April (or Garnet) was a well written character, with thoughts that are understandable (logical) and relatable, and with a personality that I favor. This was a sweet story, a quick read, and one that teaches you a bit about life's many mysteries. Garnet gets dropped off with relatives when her mom goes off to Florida with a friend to look for work. Garnet, who isn't all that happy about the situation, learns about the importance of family and makes new friends. I did enjoy this quick read, although the ending was a bit of a letdown for me. Questions. As I see it, that is what this book is really all about. It's not about the author having the answers that we seek to life, able to treat the story's every situation with an uncanny insight that reveals to us parts of ourselves we had never fully recognized. No, Ruth White is just as much a questioner as you or I, and the intent of this book is not to provide concrete answers. Just as the characters are prompted to do by the circumstances of their own lives, the story pushes us to ke Questions. As I see it, that is what this book is really all about. It's not about the author having the answers that we seek to life, able to treat the story's every situation with an uncanny insight that reveals to us parts of ourselves we had never fully recognized. No, Ruth White is just as much a questioner as you or I, and the intent of this book is not to provide concrete answers. Just as the characters are prompted to do by the circumstances of their own lives, the story pushes us to keep on asking questions about the complexities of life. Even if we never come to a fully satisfying conclusion by way of our questions, the only way to continue moving forward is to ask them, anyway. For Garnet, a girl now in her early teen years who was born with her father already gone from her life, it's not the best time for her mother to be taking off and leaving her behind with distant family. That is the reality of Garnet's life, though, in the year 1957. Her mother has secured a job out of state and wants some time to move there and settle in on her own before Garnet joins her, so Garnet is sent to stay with her absentee father's family in Black River, Virginia until her mother sends for her. Becoming a teenager can be hard enough without going through major external life change at the same time, and now Garnet feels as if she has been left behind by both her mother and father. Disillusioned and uncomfortable, she arrives in Virginia on her own with no idea what her father's family is going to be like; all she knows is that she wishes, for once, that she had a stable family life and could rely on something to stay the same for a while. Though her father walked out on her mother when Garnet was still in the womb, it's his family who finally gives Garnet a little bit of the consistency that she's been craving. Such a happy, vibrant, excitable bunch of people Garnet has never been around before. The house is filled with the cheerfulness of laughter and the natural kindness of a close family bound by love, and this sense of family togetherness is a new experience for Garnet. While still resentful of her mother for going away, leaving her occasional correspondence through the mail unanswered as a way of giving silent voice to her disapproval, Garnet's heart begins to mend in small ways as she connects with the family she's never known. Her father may have been no good, but his family is definitely all right. And then there's Garnet's first foray into love as she meets the son of a pastor, a boy with the improbably awesome name of Silver Shepherd. Silver has a complicated past of his own that is marked by the absence of a parent, but when he and Garnet are together their problems fade away temporarily, and real magic is ignited. The rush of excitement when the boy she likes first grabs hold of her hand, the light touch of skin on skin like a thousand tiny zaps of electricity; the dizzying pleasure of walking side by side alone, free to talk about anything or just to traipse along in silence, reveling in the reality of his intoxicating presence; the unexplainable sense of sharing something special that no one else is capable of understanding, and knowing that he likes her just as much as she likes him. As Garnet becomes comfortable with her extended family, she also grows closer to Silver, and the thought of eventually having to leave when her mother sends word is a reality that she does her best to ignore. Beyond even all of this, though, Ruth White has a few surprises in store for the reader, ones that I won't delve into in deference to those who haven't yet read the book. The wisdom of the story repeatedly circles back to the idea of always asking questions, though, understanding that there are so many random and unexpected incidents in life that have no answer to their "whys", but that doesn't mean we should stop asking. When someone we love leaves or a tragedy strikes or we lose our way forward in life, searching for the answers is still a very important thing, and can allow us to stay connected to what appears to have been lost. True stories don't usually turn out perfectly, and A Month of Sundays ends, for the most part, in as big a mixed-up jumble as real life, but it shows us that there's always an answer to be sought right around the next corner. If we're not still asking, though, then we might miss it. This was a cute story and interesting for middle schoolers. Awesome, but sad at some parts. April Garnet Rose is angry at her mother for packing her off to her Aunt June's home in Virginia while her mother finds work in Florida. She finds, though, that life with Aunt June (her estranged father's sister), Uncle Otis, and cousins Avery and Emory isn't bad at all, especially when she meets Silver Shepherd, a local preacher's son. I really liked most of this book--it's a simple story set in about 1956. The author could have included more historical elements to make the time period clearer f April Garnet Rose is angry at her mother for packing her off to her Aunt June's home in Virginia while her mother finds work in Florida. She finds, though, that life with Aunt June (her estranged father's sister), Uncle Otis, and cousins Avery and Emory isn't bad at all, especially when she meets Silver Shepherd, a local preacher's son. I really liked most of this book--it's a simple story set in about 1956. The author could have included more historical elements to make the time period clearer from the beginning--it took me a while to pick up on when it was supposed to take place. I did figure out that it was the 50's, though, since the family had a TV, but the station signed off at 11pm, and they had a freezer. April's poodle skirt confirmed the decade, but I didn't get the exact date until April said late in the book that she was born in 1942 (we knew she was 14 years old). The story dealt with faith in a sweet, subtle, respectful way. April and Silver were both skeptics, but April also had mixed feelings about all of the churches her Aunt June took her to, and about the seeming miracle that happened to June. Still, the author stayed out of the faith argument and let the characters be themselves, which was wonderful and uplifting to read. This was a quick and enjoyable book. It tells the story of a teenage girl, April Garnet Rose, who spends a month with some relatives that she has never met while her mom looks for a job in Florida. The aunt that she is staying with, Aunt June, has been visiting a new church every Sunday in an attempt to find God. April Garnet goes with her every Sunday to the different churches. During this time, April Garnet also meets a boy, Silver, who she begins to date. April Garnet finds out that Aunt June This was a quick and enjoyable book. It tells the story of a teenage girl, April Garnet Rose, who spends a month with some relatives that she has never met while her mom looks for a job in Florida. The aunt that she is staying with, Aunt June, has been visiting a new church every Sunday in an attempt to find God. April Garnet goes with her every Sunday to the different churches. During this time, April Garnet also meets a boy, Silver, who she begins to date. April Garnet finds out that Aunt June actually has cancer and the doctors don’t think she has much longer to live. However, one Sunday, while visiting a church, Aunt June is brought forward and healed. No one in the family believes it really healed her, but a few weeks later her test results show that she no longer has cancer. At the end of the month, April Garnet also gets to meet her dad for the first time. He never knew that he had a daughter and she’s hopeful that they will have a good relationship in the future. This book had religion running throughout, but it wasn’t the main focal point. April Garnet sees the power of prayer and faith when her Aunt June is healed. But she also experiences heartache and begins asking why bad things happen to good people. I think this book showed religion and Christianity in a positive light. I think it honestly showed that good and bad things happen and that no one has all the answers. April Garnet Rose is fourteen, lives with her mother and doesn't know her father. Suddenly her mother wants to move to Florida, but tells her that she will have to stay with her aunt June, who is Garnet's (her mom insists she is called that instead of April) father's sister until her mother has the money to send for her. Garnet isn't happy about this, having to stay with people she doesn't know. But it seems she has no choice. And at first she is really mad, until she gets to know her aunt, uncle April Garnet Rose is fourteen, lives with her mother and doesn't know her father. Suddenly her mother wants to move to Florida, but tells her that she will have to stay with her aunt June, who is Garnet's (her mom insists she is called that instead of April) father's sister until her mother has the money to send for her. Garnet isn't happy about this, having to stay with people she doesn't know. But it seems she has no choice. And at first she is really mad, until she gets to know her aunt, uncle, cousins and grandpa. And meets Silver. I read this book because I'm doing a 50 states challenge and this one is set in Virginia. I honestly didn't think it would be a book that I really liked, but I ended up liking it quite a bit. It definitely has a southern 50s, summer feel to it. The book is only 168 pages and so it moves pretty fast. The writing style is nice though and I felt I was able to connect to the main character right away. You're right in her head the whole time and so it was easy to experience what she felt. This book made me teary-eyed a number of times. Some parts were just so sad. I liked all the characters too. They had unique names, which I thought was neat. I loved Belle Prater's Boy and keep reading books by White hoping that magic happens again. Perhaps unfair pressure for the author, but there it is. This was a sweet story, but not particularly - well, it wasn't bad or unreadable. It just missed so many opportunities to be amazing. April Garnet - called Garnet at the insistence of her mother - is dropped off at her heretofore unknown aunt June's house so her mother can find work in Florida. June is her father August's sister, and he abandoned Ga I loved Belle Prater's Boy and keep reading books by White hoping that magic happens again. Perhaps unfair pressure for the author, but there it is. Delightful and insightful. When April Garnet is dumped at the home of her aunt -- a person she never met, she is down right angry at her mother. Feeling abandoned, she refused to take calls or respond to letters written to her by her mother. As her mother searches for work in Florida, April Garnet lives in Black River, Virginia. Soon, April learns to find security in the warm family atmosphere and for the first time in her life she feels as though she belongs. Attending various church services wit Delightful and insightful. When April Garnet is dumped at the home of her aunt -- a person she never met, she is down right angry at her mother. Feeling abandoned, she refused to take calls or respond to letters written to her by her mother. Attending various church services with her Aunt, she realizes that her Aunt is in search of something. Later, she learns that her Aunt is in search of health and to be free of the cancer that is growing. The year is 1957. The place is Black River, VA. Her mother leaves fourteen year old April Garnet Rose with her father's relatives while she goes to Florida to find work. Garnet joins her aunt June Bill on her search for God. They attend a different church every Sunday and experience many unusual things. On her Aunt June's search for God, Garnet begins to discover herself. An unforgettable summer turns into a life changing experience. What I thought: I really liked this book. The regional flavor i The year is 1957. The place is Black River, VA. Her mother leaves fourteen year old April Garnet Rose with her father's relatives while she goes to Florida to find work. Garnet joins her aunt June Bill on her search for God. They attend a different church every Sunday and experience many unusual things. On her Aunt June's search for God, Garnet begins to discover herself. An unforgettable summer turns into a life changing experience. What I thought: I really liked this book. The regional flavor is just right. The characters were all likable and believable. I wonder what inspired Ruth White to write A Month of Sundays. Maybe there will be more books about Garnet. Garnet is moving to Florida. Well, technically, she's staying with family members she's never met while her mom goes to find a house and job in Florida before sending for Garnet. So while Garnet's mom is gone, Garnet has the time of her life with new family and friends. Now Garnet has a big problem: she doesn't want to leave. While a short book, White was able to squeeze a lot of great stuff into this book. There are conflicts and triumphs and discoveries and growing horizons. I liked getting to meet Garnet's family and enjoying new experiences with her, but this book didn't pull me in. I was really excited for this book, because I thought it was going to be an interesting look at religion. While I still think it had its merits, there were definitely aspects that took away from the book for me. I found the time difficult to place, because the book discusses people celebrating the country's centennial while also talking about TVs. I think perhaps they meant bicentenial? I'm not sure. I also thought the ending was just...bad. This book is actually a four star book--great characters, and it certainly held my interest (which is saying something for a youth book). It lost a star due to something that took place near the end of the story. What can I say? It's high expectations, but I like happy endings. The very realistic "something" that happened dulled a bit of the happily ever after for me. Still, it's a great little book. Liking Ruth White's previous Little Audrey I wanted to check this one out. I found so much to like in this book. The ending was a surprise, but I after that shock I found myself liking its abruptness. I could dwell on Aunt June's religious healing or Garnet not knowing more about her parents, but that takes away from the overall experience of the story: a short, sweet visit to mid-20th century Appalachia with a charming 14 year old girl narrator. This story sweep me up and took me on a journey that I was not expecting. This is a beautiful coming of age story that touches on life, family, faith and what is really the most important moments in life. I highly recommend you read this book. Also the fact that it is set in the Appalachian region and I knew many of the place that were discussed in the book. A family story set in the 1950's in Virginia. April Garnet Rose is left by her mother with Aunt June and her family, while she goes to Florida to look for work. April has never known her father, August Rose, who Aunt June calls the Happy Wanderer. April meets Silver Shepherd during one of her weekly visits to local churches with Aunt June and falls in love. I'll recommend this one to 5th grade girls and up, who are looking for a sweet young romance. I stayed up late, sacrificing my then precious little sleep to finish this book. In the end, I ended up throwing the book to the ground in disgust the moment the person died. Later I checked to make sure he hadn't survived, and when I found he hadn't, I vowed to hate the book and the stupid ending with the character learning the unrealistic lesson. This is a beautiful coming of age story that touches on life, family, faith and what is really the most important moments in life. I was born in the Appalachian hills of Virginia, which is the setting for Belle Prater's Boy and The Search for Belle Prater. I lived there until I graduated from high school and went away to college. Though I left the hills, they never left me. My memories of those years are quite vivid. I have always referred to that time as both traumatic and wonderful. I get most of my ideas for my stories fro I was born in the Appalachian hills of Virginia, which is the setting for Belle Prater's Boy and The Search for Belle Prater. I lived there until I graduated from high school and went away to college. Though I left the hills, they never left me. My memories of those years are quite vivid. I have always referred to that time as both traumatic and wonderful. I get most of my ideas for my stories from those memories of my childhood home, the small coal-mining town of Grundy, Virginia. I started writing at a very young age. I remember trying to write stories before I was even able to put long sentences together. It was just something I felt compelled to do, probably because I loved stories so much. We had no television because my family was very poor; my mother was raising my three sisters and me with very little money. So we read aloud and enjoyed each other’s company. Eventually I became a teacher and then a school librarian. Working in the public schools among adolescents fueled my desire to write, and I suppose the age group I worked with helped me determine that I wanted to write for them instead of for adults or smaller children. I wrote my first book, The City Rose, based on an experience that happened when I taught seventh and eighth grade in Mt. Pleasant, North Carolina. The schools had recently been integrated, and I had two black girls in one of my classes. I noticed that whenever we went to the library, they didn’t check out any books. Finally, they told me that it was because they couldn’t find any books about black children. So I decided to write one. For Belle Prater's Boy, my inspiration came from Grundy, like it has so many times. When I was small I used to ride through the nicest residential area there and look at the pretty houses and manicured lawns. I thought these were wealthy people who had ideal lives. Only in later years did I realize that the people living in those houses were quite average, living the way most Americans live. They had their own particular problems, which I could not even imagine. So I decided to set a novel there. First, I created Gypsy, the city mouse, who lived in one of those pretty houses, and Woodrow, the country mouse, who was from the sticks. Then I asked them to tell me their story. I didn’t plan to write a sequel to Belle Prater's Boy. I thought Woodrow's theory about what happened to his mother would be enough for the reader, but it obviously was not. I had many letters from readers wanting to know what happened to Belle, and asking me to write a sequel. Actually, I did the first draft of the sequel in the late nineties. After many revisions, I created The Search for Belle Prater.